The mid-continent rift formed about 1100 Ma (million years ago) in the Precambrian. It extends from northern Kansas to Lake Superior, where it sharply turns south to the lower peninsula of Michigan. Toward the center of the rift, the thickness of the volcanic rocks reaches 25 kilometers. The following are the rock types from the oldest to youngest in age. 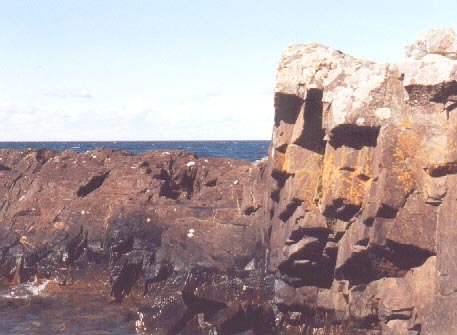 erupted rocks, but only about 5 km is exposed on the Keweenaw peninsula. The period of rift volcanism extended from 1109 to 1089 Ma, with the Portage Lake Volcanics erupting over a two or three million year span around 1095 Ma. There are more than 200 individual flows that comprise the Portage Lake Volcanics. The basalts vary from a magnesium - aluminum rich olivine thoelite with minor amounts of basaltic andesite, andesite, and dacite. These rocks were derived from magma generated in the upper mantle and became increasingly more primitive (chemical composition like the mantle) as the rocks evolved. There are minor amounts of conglomerate in the section ranging in thickness from a few cm to 40 m thick, with increasing amounts as one goes higher in the section. These sedimentary rocks comprise less than 5 % of the total volume, but contained about 40 % of the copper production from the district and act as important marker beds in the otherwise similar appearing volcanic rocks. The Porcupine volcanics are similar to the Portage Lake volcanics, but have been erupted in the southwest portion of the map in the Porcupine Mountains. The Copper Harbor Conglomerate varies between 100 and 1800 meters thick. It overlays and interfingers with the top of the Portage Lake Volcanics. There are up to 31 lava flows in the Lake Shore Traps, which are near the top of the Copper Harbor Conglomerate. The Lake Shore traps have an age of about 1087 Â± 1.6 Ma. They exhibit more variability in composition and range from Fe-rich olivine thoelites to thoelitic andesites at the top of the section. 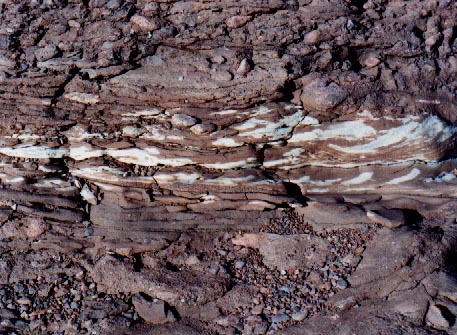 These sediments were deposited in an arid climate with seasonally high rainfalls. The Nonesuch Shale is a mixture of siltstones, shales, carbonates, and minor sandstone. These were normally oxidized, but near the White Pine Mine south of the district, the shales become black and reducing. This area has produced about equal amounts of copper sulfide and native copper ores. The Freda Sandstone is a red/brown ferruginous sandstone, siltstone, and mudstone. This formation is at least 3700m thick (the top of the section is not exposed). The Jacobsville Sandstone (over 3000m thick) is a red to white coarse to fine-grained feldspathic quartzose sandstone deposited in a rift flanking basin to the east of the Keweenaw Fault. 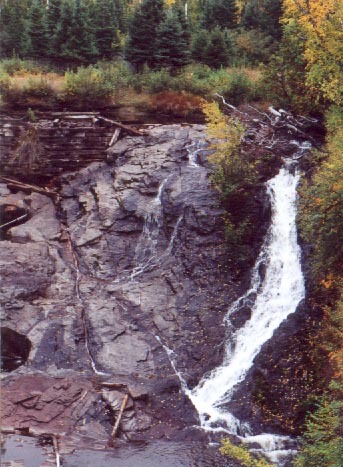 The Keweenaw fault forms the contact between the Jacobsville and the Portage Lake Volcanics. The Jacobsville is unconformably in contact with early Proterozoic and Archean rocks further to the east. 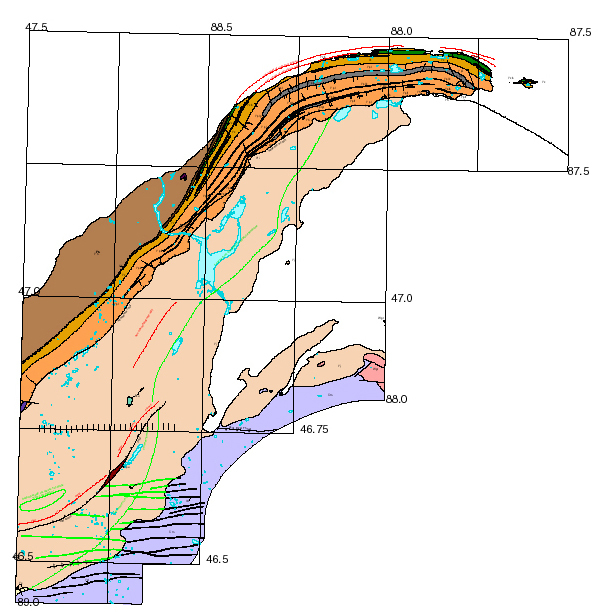 The Keweenaw fault was originally a normal fault bordering the eastern edge of the rift. Later compression of the rift, changed the throw of the fault (fault movement) and resulted in a high angle reverse fault. Photographs of rocks and outcrops of rocks from the Keweenaw peninsula. Geology east of 89Âº from U.S. Geological Survey Open-File Report 99-149 By William F. Cannon, Michele E. McRae, and Suzanne W. Nicholson 1999. Geology west of 89Âº after Bornhorst (1994). 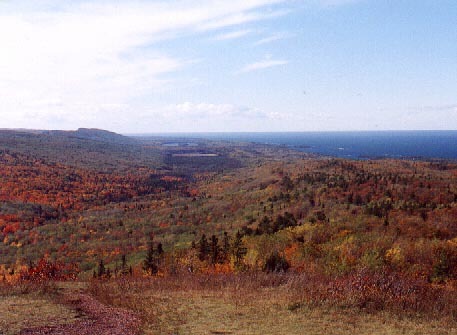 View from west end of Mount Brockway toward Lake Bailey (center, in the distance) and Lake Superior (right) - Stop 25. The ridges are made of the more erosion resistant conglomerates while the valleys consist of more easily eroded sandstones and shales. To the south (left) of Lake Bailey is Lookout Ridge, which marks the contact between the Copper Harbor Conglomerate and the Portage Lake Volcanics. Lake Bailey is on the same stratigraphic horizon as Lake Fanny Hooe. Eagle River Falls (Stop 21 - N47Â° 24.07' W88Â° 17.67') Contact between top of Portage Lake Volcanics and base of Copper Harbor conglomerates. Several potholes have developed to the left. Ropy surface on the volcanics are pahoehoe type of lava. A dam ( on the left) was constructed to provide water power for a manufacturing plant. Horseshoe Harbor Stop C1. Conglomerate clasts consist of rocks such as this highly vesicular basalt (5cm long). Minor crystals in the vesicles are of calcite or zeolites. Copper Harbor conglomerate at Horseshoe Harbor. Most of the beach is composed of cobbles and pebbles of the Portage Lake Volcanics. If one walks the shoreline, you can see the size differentiation caused by the wave energy of Lake Superior. There are large pebbles just below the waterline, while smaller particles are found at the beach water interface. Slightly further on shore, one can find sand sized particles. 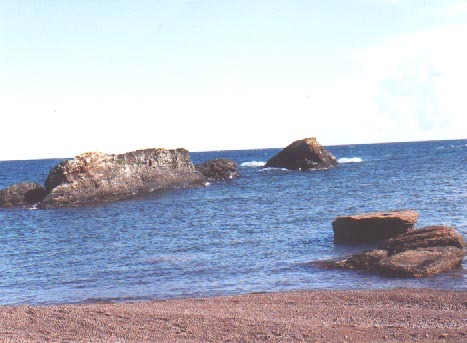 The severe storms on Lake Superior cause the rounding of the rocks and often bring up newly eroded rocks from the lake bed. This constant replenishment can result in good hunting for agates and other amygdaloidal minerals found in the volcanic rocks. Some collecting has taken place in the waters surrounding the Keweenaw peninsula. Datolite nodules have been found in offshore rocks and a large piece of copper has been recovered by scuba diving. 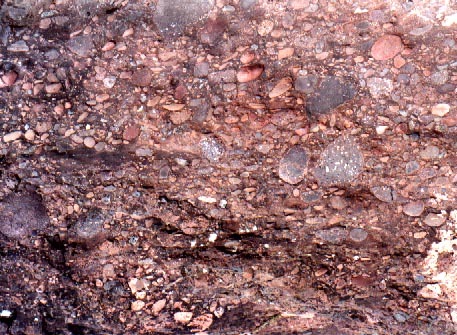 Central portion of a volcanic flow from the Lake Shore Traps within the Copper Harbor Conglomerate. These rocks are a fine grained and massive (without any mineralization) iron rich olivine thoelite basalt. The rocks parallel the shoreline and dip about 20Â° toward the lake. These rocks were not as severely metamorphosed (only zeolite grade as compared to the prehnite/pumpellyite grade in the Portage Lake volcanics). Esrey Park Stop 24. This is the Copper Harbor Conglomerate. It consists of clasts of the Portage Lake Volcanics. Largest clast is 6cm in size. Horseshoe Harbor ( Michigan Chapter - Nature Conservancy) Stop C1( N47Â° 28.37' W87Â° 48.03'). The white speckling in some of the clasts are amygdaloidal fillings of calcite or zeolites. Stomatolites (white) in clastic rocks - either arkosic sandstones grading into fine grained conglomerates. Stromatolites (Collenia undosa) are calcareous growths of algae and bacteria. These were deposited in stream channels within the Copper Harbor Conglomerate. The contortion may be due to soft sediment deformation at the time of deposition or early compaction. Stromatolites are 3cm in the vertical direction. Horseshoe Harbor ( Michigan Chapter - Nature Conservancy) Stop C1.